You are about to enter another dimension, a dimension not only of sight and sound, but of mind. Next stop, the Cranberry Zone! While Thanksgiving could possibly also be associated with the Yam Zone or the Turkey Zone, I think Cranberry Zone is more appropriate. Why? 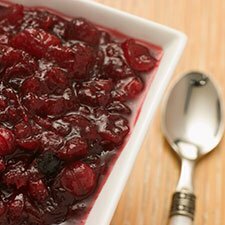 Cranberry relish or sauce is pretty much a requirement at every Thanksgiving table, but it’s one of those foods we pretty much never think of the rest of the year. Starting in early November, cranberries and cranberry sauce start to fill the shelves at the grocery store. 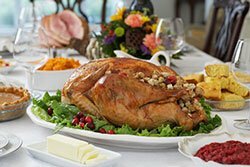 When June rolls around you’ll still find Turkeys and yams in the same place, but by then we’ll be so far away from the Cranberry Zone that tracking down a can of cranberry sauce at your favorite grocery store could be next to impossible. My own grandmother made hers bubbling on the stove with a cup full of sugar (from the recipe on the back of the cranberry package). 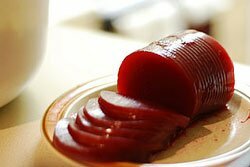 We also included the canned cranberry relish, slid neatly from the can. As Toni Allison, Executive Director of Knowledge for Success, points out: the tradition of the canned cranberry isn’t just about opening a can. Traditions go with it that include the plate it rests on, and how you must carefully slice the relish along the edges where the canned rings were (because cutting the other way would just be wrong). Absolutely no random scoops with a spoon! Whether you prefer sauce, relish, or Pinkout, we all relish our cranberries while we’re living in the Cranberry Zone. 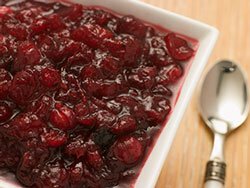 In California, a twenty-three-acre area was zoned for single-family dwellings, but it eventually became the home of cranberry sauce. The property in question was originally purchased by Victor and Susan Baranco. Alexander Van Sinderen moved onto the property in 1971 and was joined by a group of individuals who began living together on the property as a community which eventually became known as Morehouse. At one point the community made the unanimous choice to open up the property to homeless “guests.” When they “ran out of room indoors,” the community permitted the “guests” to use tents on the property. In March 1992 James Hall, zoning investigator for the County, received a complaint regarding possible zoning violations on the property. Hall sought an inspection warrant to further investigate the alleged zoning violations at the Morehouse community. A warrant was issued and when the property was inspected Hall and his associates Hall saw tents, some with wooden floors and frames; cots built into tents; a built-in wall unit; tents with furniture and personal items (clothing, sleeping bags, comforter, footlocker, radio, magazines, food, a cooler); and people sleeping in tents. One tent contained a waterbed. Hall also saw inoperable vehicles and car parts; piles of scrap metal and scrap wood and building materials; stored food, people processing food, plus a building full of canned cranberry sauce; several 55–gallon drums; and an outhouse. That November, the County filed a complaint, alleging that defendants were maintaining tent residences; a food packaging, warehousing and distribution center and facilities; a junkyard; a storage yard; a contractors’ yard; and abandoned vehicles. This was due to violations of their zoning laws. Let’s be frank: If you are sleeping in a waterbed in a tent, you probably are not too concerned with zoning laws, but you might be serious about your cranberry sauce. A building full of cranberry sauce is obviously a commercial purpose, in violation of the zoning for single-dwelling residences. It was, in an unconventional way, a home-based business. The zoning is a way for a city or county to plan allowable uses for a property area. Just like Toni and her canned cranberry sauce, the city/county have particular ways they want the land divided and “served” to the community. Zoning laws are essential to determining where you can run your business, especially if you are a home based business. Certain zoning laws could prevent you from operating out of your home. Enterpreneur.com states that, even if your business isn’t home based, it’s still a good idea to check out what zoning laws apply to you. And, remember that what the law says and what law is enforced can be two different things in practice. How do you find out what zoning ordinances apply to your business? You could go to your local city or county offices and ask informally. These laws are a matter of public record and you have a right to review them. Or, you might ask for a formal zoning confirmation letter, which is a written verification of the allowed uses, development standard and regulations applicable to a specific site. A zoning confirmation letter typically can be requested from an official zoning office, or its equivalent, in the county where the real property is located. Zoning confirmation letters are often used by finance institutions during due diligence purposes, but can be requested by anyone at anytime. Description of current zoning laws. Summarizes the current uses allowed. List of applicable land use history. If your business is not a permitted use, you might ask for a variance or conditional use permit to operate. The prudent method is to investigate before you start your business in a zone or before you lease a commercial lease. Want to know more? Contact us and ask for our Tenant Pre-Signing Flowchart to walk you through the process of signing a commercial lease!